One slip in the middleweight division of 2017 and that already hard to achieve title shot can just fly out of view. Ronaldo 'Jacare' Souza found that out last weekend as he took on the rising Australian middleweight, Robert Whittaker. Over one and a half rounds, 'Bobby Knuckles' kickboxed the ears off the grappling legend and sent him home with a TKO loss. The story on Jacare was already out there. He has a heavy right hand and a good right front kick, but almost nothing else on the feet. The problem is that once he gets a hold of a fighter, it almost always spells death. His guard passing is so efficient, his hips are so heavy, and his ability to open elbows and threaten submissions is unparalleled. Generally, if you hit the mat with Souza he can either submit you quickly or keep you there long enough that he'll catch you eventually. The punching power that he has developed in recent years has just been the icing on the cake. Or immediately getting down behind his lead shoulder as he re-established range. Notice that Jacare makes a long dive for Whittaker's legs through the distance—he did the same thing against Tim Boetsch and others and it can be a very tiring way to fight. Even when minding his 'ps and qs', Whittaker still came close to eating that powerful right on occasion, but for the most part Whittaker controlled when Souza could fire and was in position to deal with it whenever Souza did. Whittaker worked beautifully with his left, flicking and teasing Souza. The feints were constantly there, throwing Jacare off as he over-reacted to each, only to stand still for the actual strikes. In Rise of the Reaper we discussed Whittaker's brilliant understanding of timing and cadence, and his use of feints to control this. The shoulder feint to jab, the double jab, and the jab / left hook double attack all showed up during this bout and all were used to put a stinging slap or a stiffer blow on Souza and keep him confused. A handful of shoulder feints, a deep step and a loose left hook in place of the jab Souza expected. The shoulder feint to legitimate left hook. This is Whittaker's value as a fighter. He is a decent hitter who can knock a man senseless if he connects clean, but he looks to set up and get in as many neat connections as possible in a fight, rather than searching for the big punch. His feints and his high work rate mean that he keeps connecting where other hitters would be whiffing on big swings or catching their breath before another attempt. He throws a lot of muck and the wall and, of course, not all of it sticks. But that is never disastrous because he isn't giving himself a hernia, loading up on haymakers. For instance, the lead shoulder feint to draw a level change, into the right uppercut while keeping the lead hand low to dig for the underhook. He attempted it a few times, it didn't score him a big uppercut, but it was just one trick in the bag being thrown out when appropriate. And the feinted right hand to stern left straight—a favourite of Badr Hari. The most important point of the bout was that Whittaker wasn't relying on his puncher's chance, he was out working and out striking Jacare consistently at a pace that he could have easily kept up for the full three rounds. The strikes that did the hurting were scarcely different to the strikes he was landing elsewhere in the match, they just stuck the cleanest. Another feature which might have flown under the radar was Whittaker's use of front kicks throughout. The lead leg front kick was used to intercept Jacare as he stepped in and wind him. While the rear leg front kick was used to close distance and carry Whittaker into punchign range, as the Machida boys love to do. This sequence is a beautiful summary of the fight. Whittaker jabs in, circles off, intercepts Jacare with a winding front kick to the body, then counters with a body shot and a right to the head. The end came as Whittaker put the pace on Souza and Souza, reeling from a right hand which had sent him to the mat, circled along the fence. The same flicked right high kick which Whittaker had thrown up against Natal and Brunson as they ducked to his right side came up again as Souza circled into it. It was the second connection which saw the fight waved off by a rather confused Mario Yamasaki who couldn't decide whether he wanted to be between the fighters or not. 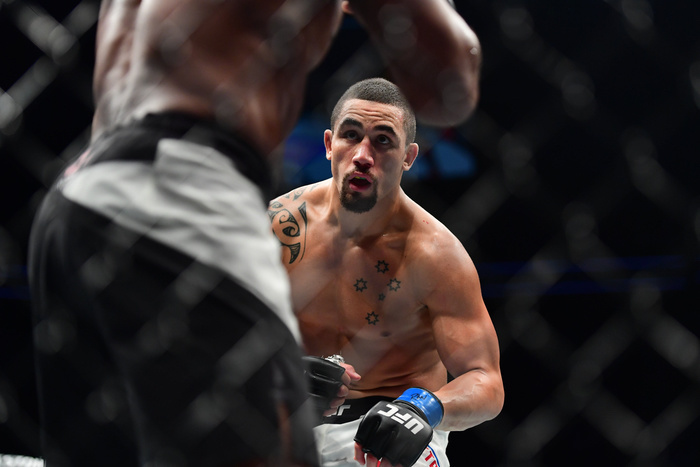 Robert Whittaker is one of the most exciting prospects in the already exciting middleweight division but it is understandable why so many wrote him off against Jacare. He is a former welterweight, and mainly a striker. It seemed to make sense that the strongest grappler at middleweight, who is also massive for the weightclass, could drag him down and maul him. While Whittaker's work in the one extended bout of clinch work was great—constantly fighting Jacare's hands and head with his own and scraping Jacare off his back along the fence—it was the speed and pace of Whittaker which won him the fight. It is not too surprising really, when current middleweight champion Michael Bisping has been proving for years that pace and accuracy mean more than any winged power punches that don't connect or takedowns that don't result in a finish. Certainly Whittaker is a nice reminder that there are as many advantages to moving up in weight as there are to going down.